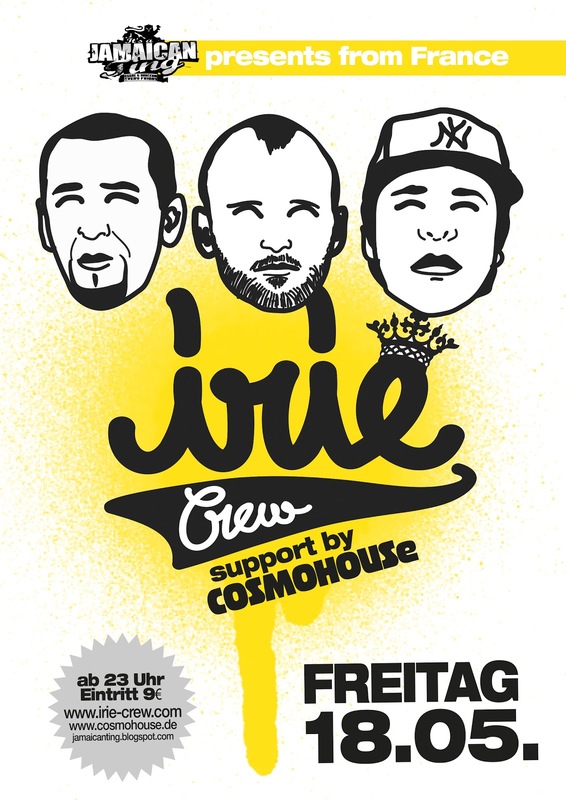 For the first Time in Munich - IRIE CREW, the Big Bad Sound outta France! Support COSMOHOUSe ... Jamaican Ting get mash up ! iRiE CrEw is a sound based in Nancy (North East France) & Luxemburg representing for and playing jamaican music all over Europe and the World. iRiE CrEw consists of the members T-Zion, Smokey, I-nity, Zeeko & Daddy Alex. T-Zion, reggae fan from the early 90's and selector since early 2000, decided to create his own sound at the end of the year 2003. After playing some dances, festivals and events alone, Smokey, I-nity, Zeeko join the crew officially in 2007. Smokey is the most appreciated selector and MC in Luxemburg, and I-nity & Zeeko played for a big sound in the north of France - it was natural bring together this potential and to join forces for a better representation on an international level. Daddy Alex joined the team in 2009 as well. Next to being an excellent juggling sound which can entertain every crowd, iRiE CrEw is taking the soundclash business serious at the same time and constantly works on creating a solid dubplate box.